Trade Minimum Volatility Funds FREE of Commission! Between global trade tensions, rising interest rates and an upcoming election, plenty of things will keep the markets volatile at least until the end of the year. No one’s recommending that you completely cash out yet. But if you don’t like turbulence, you might want to consider minimum volatility funds. They are subsets of equity-based exchange traded funds (ETFs) that provide more stability than conventional market indices — and, yes, the more popular ones are commission free, which we’ll explain further down. Minimum volatility ETFs include equities that don’t move around as much in value — both the downside and upside can be more modest than the broader markets’ performance. While an ETF that’s strictly minimum volatility might save you money, you might also miss out on some gains if you stay in the fund too long. That doesn’t necessarily make it a short term play for when markets get choppy. A longer-term play that’s related to minimum volatility and partly overlaps with it is called smart beta — in fact, some funds are both minimum volatility and smart beta, but the two aren’t synonymous. Except that the word “beta” does mean volatility to financial professionals. Smart beta refers to ETFs that get recalibrated more frequently than conventional ETFs. Minimum volatility ETFs include equities that don’t move around as much in value — both the downside and upside can be more more modest than the broader markets’ performance. That dynamic recalibration bears enough of a resemblance to the way mutual funds are managed that — well, some financial marketers apply the smart beta label to actively managed mutual funds. Yes, these labels can get confusing — often it’s the newer products that have varying labels from one financial institution to another. Both minimum volatility and smart beta have only been around for at most a decade. Anyway, smart beta strategies include minimum volatility along with several others like momentum and growth. There are even a few that have fixed income focuses. The larger range of strategies explain why there are about six times as many smart beta as minimum volatility funds listed in ETFdb, the industry database for ETFs. Lists of both appear at the bottom of this post, courtesy of ETFDB. If any of them strike your fancy, you might want to head to TDAmeritrade, where you can trade 300 of the most popular ones free of commission. The following table of ETFs comes from the industry database ETFDB. A number of them also get classified as smart beta — which is actually a larger set of funds. A table of them will appear in a subsequent post — stay tuned for it, but in the meantime, get a load of these funds you can trade commission free. Readers, does the idea of reducing volatility appeal to you? What kind of investments do you have right now? How much do your investments cost? No, not what you paid for the shares when you bought them and not what you pay your financial advisor — this is about how mutual fund fees impact your retirement. 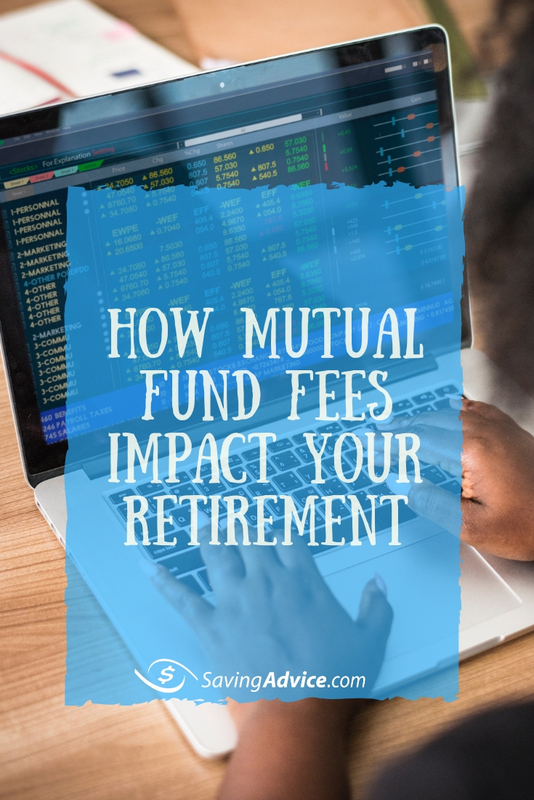 Mutual funds charge you fees either when you buy them (that’s known as a front-end load), or when you sell them (that’s called a back-end load), but it always costs you to own a fund. You can maximize your gains simply by minimizing your costs. The first step is to find out what the expense ratios on your funds are. Then you can determine what those funds are costing you. There’s a difference between those two figures. If you have a high expense ratio on a fund with a smaller balance, it might not affect your overall total returns all that much. A high expense ratio on a fund that invests in developing markets is pretty common, as it normally costs a lot to administer funds like these. A high expense ratio on investments with larger balances, though — typically funds that invest in U.S. stocks or bonds — will be problematic over time. And it can be avoided. 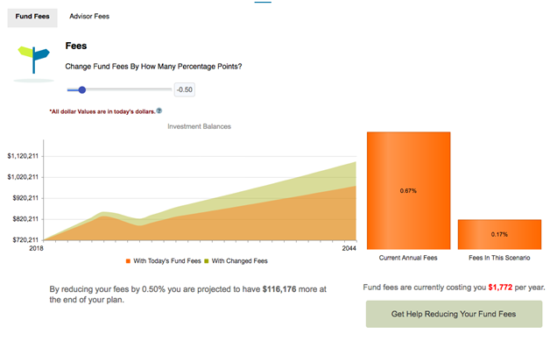 You’ll want to find out how the fees on your funds measure up to those of comparable funds. If you’re in actively managed funds — that is, funds that have managers picking their holdings — you might find that you’re paying too much, year in and year out. Are you familiar with the concept of reversion to the mean? In finance, it usually refers to the tendency of a stock’s price to move to its average price over time. If you extend the concept to mutual fund management, it says that outperforming or underperforming funds will eventually perform more like the average fund (within the same fund category). So the mean is actually something you can invest in: an index fund. There are tens of thousands of mutual funds and exchange-traded funds out there now, and among them are all the indexes you can think of. Index investing is generally pretty easy for the companies that put them together and this makes running an index fund cheap. And most fund companies pass that savings on to you. Outperforming an index for a long period is nearly impossible. So it makes sense to find index-fund options instead. You’re mainly looking for the asset allocation (like value stocks, growth stocks, or long-term bonds) those funds provide anyway. Using WealthTrace Retirement Planning Software, which anybody can sign up for, you can see what your expense ratios are–and how that translates into dollars. In the example to the left, notice how tiny the expense ratio is on the fund with the word “index” in the name — compared to the others. That’s what we’re talking about. You can do a number of things to find cheaper funds — starting with online tools that let you compare the costs. The one offered on Vanguard’s website is free. Or if you sign up for a paid Morningstar.com subscription, you get access to a fund screener that suggests funds that are similar to ones you key in — and you can look for the ones that are cheaper. You might be able to find similar tools on other fund family websites. The further you are from retirement, the more this matters. Similar to compounding, the longer the fees are paid, the greater their effect–and thus the more you’ll need to save. Let’s explain by way of examples to show how much fees might cost you in the long run. The table below shows a couple that has $400,000 saved in their IRAs. Their average annual rate of return over 25 years is 8%. 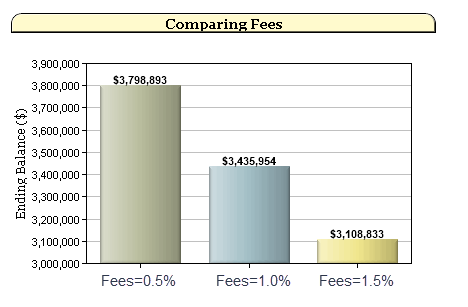 Then there are three different scenarios where they pay average fees of 0.5%, 1%, and 1.5%. You can see that if the fees are 1% lower, this couple will have nearly $700,000 more saved for their retirement. This is the power of compounding over time. It works for you when it comes to investment returns, but it works against you when it comes to fees. Let’s now take the full retirement plan into consideration. This couple in their 30s is doing a lot of smart things financially speaking, including socking away what they can to tax-deferred accounts, like their 401(k)s. But they’re not invested in the cheapest of funds, either. Their actively managed funds’ weighted average expense ratio, while not terrible, is around 1.4%. These days, with companies like Vanguard or Fidelity offering funds with expense ratios of 0.7% or even 0.07%, there’s no need for an expense ratio that high. Even before making any changes, our couple has an 83% chance of funding all of their retirement goals, according to our analysis. But if we increase their annual return by a full percentage point each year, which is essentially the same thing as getting them to a 0.4% expense ratio, their prospects get even better. With 20 or 30 years to go to retirement, the effect of the reduction in fees is going to make a huge difference. Even just reducing fees by half a percentage point instead of a full percentage point makes a big difference over time on a straight-line basis. Hopefully, this article should have convinced you that mutual fund fees can be devastating to a plan over time. But there may be ways of getting you most of what you want in your investments for a fraction of the cost. Readers, please share with us in the comments section below your experiences with mutual fund fees — and what kind of performance have you seen?